Our regular youth group meetings are on the second and last Thursdays of the month from 6:00-7:00pm, and are intended for grades 5-12 (and/or up to age 21). During our monthly meetings we have time for fellowship, prayer, learning, fun, and the youth planning for their own upcoming activities, all with appropriate adult supervision (who are approved through our SafeConduct process). Click on this Youth Fellowship Group link to go to our youth group page for more information about our youth group, upcoming youth group activities, additional youth group links, and more. The Youth Group is going ice skating on Saturday, March 23 from 5:00pm-7:00pm during the open skate time at Body Zone; 3103 Papermill Road; Reading, PA 19610. The Youth Group has decided to use some of their funds to help offset the cost, so the cost will only be $10.00 per youth for admission and rental. For more information about this event, please contact Pastor Ben Motz at 610-621-5770 or office@sprucc.org. For more information about the Youth Group and other upcoming youth activities, click on this Youth Group link. To view pics from this event, click on this Ice Skating Photos link. Once a month St. Paul's UCC offers "Soup & Such" and the "St. Paul's Clothing Closet." 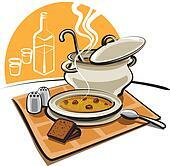 Soup & Such is a free meal for all served from 4:00-6:00pm on the second and last Thursday of the month. (Volunteers are welcome to come and help prepare and set up at 2:00pm). St. Paul's Clothing Closet offers a free bag of gently used children's clothing from 4:00-6:00pm. You can click on this Soup & Such link for more information and for this year's schedule, or contact the chairperson of the Mission Committee, Steve Miller. You can click on this St. Paul's Clothing Closet for more information, or contact coordinator Robin Henning. We are continually looking for donations of gently used children's clothing. “Called-To-Care” (C2C) is our seven session training program for lay persons engaged in the visitation ministry to our hospitalized, ill, and homebound members. Our next session will be Sunday, March 24 from 3:00-5:00pm (this is a duplicate session of that which was offered on Wednesday, February 27 from 6:00-8:00pm, for those that missed the February 27 session). There is no fee to participate in this training session. Pre-registration is encouraged to make sure that we have enough materials. To pre-register, please contact the church office at 610-621-5770 or office@sprucc.org. “Called-To-Care” (C2C) is the UCC program for lay church members to minister to the sick, hospitalized, grieving, and others in need. It is used in many different congregations and nursing home facilities throughout the country to train and organize lay visitation. In 2017, it was instituted as St. Paul’s UCC official lay visitation program. In the past couple of years, Pastor Ben has taught this twice here at St. Paul’s for our members and members of Zion’s UCC in Womelsdorf. All elders (whether currently on Consistory or not) are to complete at least session #1 & #2 by the end of February 2019, which addresses such issues as confidentiality, initiating a visit, basic do’s and don’t’s of a hospital or home visit, and more. All elders who are providing communion are to also complete session #7, which goes over the serving of communion. For more information about C2C or VCT Ministry, please contact Pastor Ben Motz at 610-621-5770 or PastorMotz@sprucc.org. Although all elders vow to assist in prayers and visits as a part of their ordination vows, other members are also welcome to participate in our VCT Ministry. However, to make sure our visits are safe and appropriate, VCT members do need: (1) to be trained in visiting (and have completed at least sessions #1 & #2 before their first visit); (2) be approved to visit by the Spiritual Council; and (3) be approved by Christian Ed through our Safe Conduct process to visit the sick and vulnerable within our church. If you are interested in being a part of the VCT Ministry, please contact the pastor, and/or the visitation coordinators: Terry Pastor and Sheri Rowe. This year our weekly evening theme will be "Giving Up Something Bad for Lent." Will be using James W. Moore's book Give Up Something Bad for Lent to guide us in prayer, discussion, worship, and scripture reflection. The first in this seven part series will begin on Ash Wednesday in the upstairs sanctuary. This will be our introduction to the topic, as well as our traditional Imposition of Ashes and the serving of Holy Communion in the pews. Over the next five Sundays (March 10 to April 7) we will be gathering in the downstairs Miller Fellowship Hall for worship with prayer, music, scripture reflection, and a different topical focus based on giving up something bad for Lent. These gatherings will be instead of weekly Wednesday evening worship. (Please note - there is NO weekly Wednesday worship for Lent this year). This will give us the additional opportunity to explore: (1) how well Sunday evening's work for a weekly worship experience (as opposed to Wednesdays); (2) how well an evening gathering in the Miller Fellowship Hall with a different format might work; and (3) how well using the projection system might work for sharing in Christian music videos as a part of our gathering. In addition, since AA meets downstairs on Wednesdays, by having gathering on a Sunday evening, we will have greater access to the nursery room for parents who may be in need of us offering an appropriately supervised nursery those evenings. We are intending for a relaxed atmosphere those five Sunday evenings. We will be offering light refreshments those evenings, and we invite all to come dressed casually. We hope that all who are able will come out, give this Lenten experimental worship a try, and give us your feedback about the experience. On Maundy Thursday, April 18 we will begin worship in the downstairs Miller Fellowship Hall with a free light meal, communion, and our seventh and final chapter of Give Up Something Bad for Lent, which is "Wrap Your Armas Around Something Good for Easter." We will then conclude worship with our traditional Tenebrae Worship Service ("Service of Shadows") in the upstairs sanctuary. There is no need to purchase a book for this series (although you certainly may if you like the topic), and there is no fee for the weekly refreshments or Thursday's meal. Visitors as always are very, very welcome. For more information about the theme or to help with worship, refreshments, paraments and decorations, or set-up, please contact any member of the Worship Committee, including Terry Pastor, Chairperson; Sheri Rowe, Consistory Liaison; and Liz Brunner, Sub-committee Coordinator. To help with nursery during any of these seven evenings, please contact Elsa Wertz, Christian Education Chairperson. [As with all nursery care, volunteers must be CHYLD Worker approved (having approved clearances, etc) before working with the children and youth within our church]. Dan Billings has spent more that 40 years in law enforcement and security. As a police academy instructor for the past 24 years, he has taught officers in dozens of topics including, Use of Force, Officer Safety, Avoiding Ambush Situations, Civil Law, and De-Escalation Techniques. He is the Director of Security for the Senate of Pennsylvania in the State Capitol. Previously he was in charge of the F.O.P. Critical Incident Stress Program for 26 years and responded to a significant number of police involved shootings. He will be presenting the importance of safety regarding owning, storing and carrying a firearm. He is a proponent of the right to bear arms under the second amendment and a very strong advocate for doing so safely. Police officers routinely encounter people in possession of firearms, both legally and illegally. Many illegally possessed firearms are stolen from law abiding citizens. He will discuss the many factors that should be considered before, during and after a citizen decides to use a firearm to stop a criminal act. Mark the date on your calendar and plan to join us on Sunday, March 31, 2019. Following the 10:25am worship service, there will be a free luncheon in our Fellowship Hall at about 11:45am, and this free seminar will begin at 1:00pm. If you have any questions, please contact the church office at 610-621-5770 or office@sprucc.org. Details coming soon. For more information, please contact Terry Pastor, Chair of the Worship Committee. Below is the schedule for the Wednesday Lenten services at noon. During our 10:25am worship service we will be ordaining and installing a new deacon and a new elder for ministry at St. Paul's UCC. We will also be sharing in Holy Communion on this first Sunday in the month of April. For more information about this worship service, please contact Terry Pastor, chair of the Worship Committee at 610-621-5770 or office@sprucc.org. As part of our “2020 Vision - Six Year Growth Plan,” we have adopted the Missional Approach as our philosophy to evangelism and church growth. The Missional Approach to evangelism and church growth is all about reclaiming the Great Commission and living out the Great Commandment. Pastor Ben will be offering a workshop on the Missional Approach on Tuesday, April 30 from 6:00-8:00pm. The workshop will cover our long-range "2020 Vision - Six Year Growth Plan"; the missional approach philosophy of church growth, the discernment process, and highlights from Reclaiming the Great Commission (one of our main resource books for this approach). [This is a repeat of the same workshop that was offered on Wednesday, January 16, 2019; and it is a postponement of the workshop previously scheduled for Wed, April 10]. This free workshop is open to members and visitors alike. Preregistration is encouraged, so that we can have enough materials photocopied in advance. To register, please use the sign up sheet in the hallway or contact the church office at office@sprucc.org or 610-621-5770 by Sunday, April 28. As part of the Six Year Growth Plan, all Consistory members and all Standing Committee Chairpersons who did not attend this refresher last year, should attend this workshop this year, as well as other leaders and staff. For more information about this workshop, please contact Pastor Ben at 610-621-5770 or PastorMotz@sprucc.org. You can pay with cash or check at the door. To purchase your tickets online, click on this Online Purchase link, in the "Fund-Raiser Line" type in the total amount of your ticket(s) and type in "Ham & Dandelion" or just "H&D" for your description, enter your payment method, print your receipt, and bring that receipt along with you to the dinner. For more information about the dinner, please contact Mike Keffer, Chairperson of the Men's Fellowship Group, or Steve Miller, Chaiperson of the Fund-Raiser Committee. For more information or for assistance in using the online purchasing option, please contact the Financial Secretary Terry Pastor at office@sprucc.org or 610-621-5770. The youth group is planning a Sunday afternoon geocaching activity at Blue Marsh. We will meet at 1:00pm at the church parking lot, and carpool to the Old Church Road parking lot at Blue Marsh (which is located between the bridge and the intersection of Old Church Road and Route 183). We will begin hiking from that parking lot at 1:30pm. If you are interested in going, please let Pastor Ben know if you will be meeting at the church parking lot at 1:00pm or at the Old Church Road parking lot at 1:30pm. Please also let him know if you need transportation. There is no fee for this event. Friends in grades 5 and up are welcome. Expect to be hiking for a few hours as we look for the geocache. (This activity was originally scheduld for Sunday, February 24, but was postponed due to the winter weather that day). In the event of significant rain, this event will be postponed. Announcements about postponements will be made during worship that Sunday morning, and we will strive to add that to our Snow Cancellation web page. If you do not have a Youth Registration Form on file at the church office (which includes allergy and emergency contact information), please click on this Youth Registration Form link, print the form, fill it out, and bring it with you to this activity. If you are not sure if you have this form on file, simply contact the church office at 610621-5770 or office@sprucc.org to inquire. ☐ snacks (such as granola, fruit, dried fruit, nuts, jerky, etc). ☐ small backpack to carry your snacks, water bottle, extra socks, etc. For more information about our youth group and a list of upcoming youth group activities, please click on this Youth Fellowship Group link to go to our youth group page. The Sunday before Easter is "Palm Sunday" and "Passion Sunday." Palm Sunday celebrates Jesus' triumphal entry into Jerusalem. Passion Sunday commemerates the beginning of Holy Week. We will have our traditional "Blessing of the Palms" this Sunday, and we will have enough palms for everyone to be able to take a blessed palm branch home with them. For more information about this worship service, please contact any member of the Worship Committee (Terry Pastor Chairperson and Sheri Rowe Liaison). St. Paul’s is holding their annual Easter Egg Hunt on Sunday, April 14, following the Sunday worship service for the youth ages 0-12. We are asking for donations of individually wrapped candy to put into plastic eggs and dyed, hard boiled eggs. Thank you. For more information, please contact the Christian Education Committee: Elsa Wertz or the church office at 610-621-5770 or office@sprucc.org. 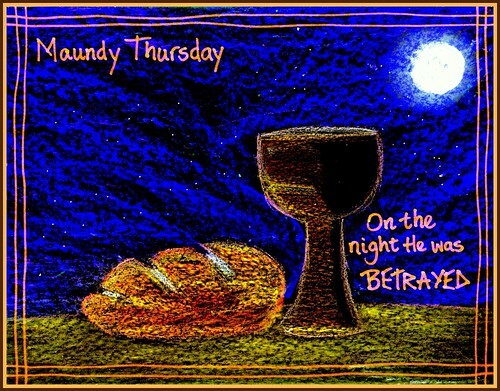 On Maundy Thursday Jesus gathered with the disciples for the Feast of Passover. They shared in a meal. He took bread, blessed it and broke it, and instituted the Lord’s Supper (Holy Communion). He then took his disciples to a garden to pray, where he was betrayed and crucified. On Thursday, April 18 at 6:30pm, we will begin worship in the Fellowship Hall at table with one another. We will have a free light meal and communion. Then we will process to the sanctuary for Tenebrae - the service of shadows - where we will pray, hear the last words of Christ, and strip the altar in preparation of his crucifixion, as the sanctuary slowly becomes shrouded in darkness. We hope you will join us for this meaningfully spiritual service. The meal is provided by the church; there is no charge for the meal, and there is no need to bring any food along with you. As always, visitors, friends, and members are all equally welcome. (Please note, with having Tenebrae included in our Maundy Thursday worship service, we will not be having a separate Good Friday worship service). Our Easter Sunrise worship service will begin outdoors around a fire with candlelight, right before sunrise, and conclude in the sanctuary. There will be the processional of the cross, the return of the light to the sanctuary, and Holy Communion. We will have our usual Sunday school classes for all ages at our usual 9:15am time. Our second Easter worship service will take place at our regular time 10:25am. We will have a chidlren's sermon, regular sermon. children's bulletins, available nursery, the choir, the bell choir, and Holy Communion. Join us for the celebration of the resurrection of Christ. For more information about our Easter worship services, please contact any member of the Worship Committee (Terry Pastor Chairperson and Sheri Rowe Liaison). This four week series begins on Sunday, April 28, 2019. Our classes will be from 9:15am - 10:15am, and will be held downstairs in the Miller Fellowship Hall. During this series we will be learning about God, the Bible, the UCC denomination, discipleship, St. Paul's UCC, the sacraments, your questions, and more. This class is helpful for new members and those considering membership - without any pressure to join the church. This class also serves as our New Member Class. If you participate in this class, there is no obligation or pressure to join. This adult class is open to visitors, new members, long-time members, and everyone in between. If you joined St. Paul’s UCC within the past year or two, and have not taken this class, you are especially encouraged to participate, as we want you to know your church well. You are welcome to participate even if you cannot make all the classes. Even if you can only make a couple of the classes, we are happy to have you participate. There is no fee. Please pre-register for the class by contacting the church office at office@sprucc.org or 610-621-5770 or sign up in the narthex hallway (preferably by Sunday, April 21), so we can be sure to have enough materials for everyone for our first day of class. However, you need not pre-register, walk-ins will be very welcome. Please note: The Exploring Faith Series is normally a six week series, but due to other scheduling conflicts, we will be condensing the spring 2019 series to just four weeks. For more information about this series, please contact Pastor Ben Motz at 610-621-5770 or PastorMotz@sprucc.org. Our youth group has selected this year's Holy Humor Sunday's theme, which is "Drawn to Christ." We invite you to wear a t-shirt, sweatshirt, or tie with your favorite art or artist (painter, dancer, music, instrument, sculpture, etc), or come dressed as your favorite artist, or just come dressed in casual clothing. We will have some uplifting humor, hands on experiences for youth during worship, special artistic decorations, children created bulletin covers, light refreshments to follow, and more. Holy Humor Sunday is an opportunity to let our hair down - way down - with a very upbeat and fun service, following the somber season of Lent. It is a day of humor and light-hearted fun. Holy Humor Sunday shares its roots with that of April Fool’s Day. When Jesus rose from the dead on Easter Sunday, he defeated death, and in doing so the Great Deceiver (i.e. the Devil) was deceived - bested by the best trick ever. From deceiving the Great Deceiver on Easter, April Fool’s Day came to be celebrated on April 1st, and Holy Humor Sunday came to be most commonly celebrated on the Sunday following Easter Sunday. 2018 Holy Humor Sunday - Theme: "Medieval"
2017 Holy Humor Sunday - Theme: "Game On!" 2016 Holy Humor Sunday - Theme: "Come Fishing"
2014 Holy Humor Sunday - Theme: "A Childlike vs A Childish Faith"
Mark your calendars now to come out and support the youth at their car wash. The cost is $5.00 per car. The location is Boyer's Food Market in Womelsdorf. You can pay by cash or check. Youth should arrive between 9:30-9:45am to help set up. Youth should expect to stay until 2:15-2:30pm to help clean up. This fund-raiser will be used to help offset the costs of Youth Group activities. [Please note the change in time from previously advertised: the car wash will now be from 10:00am to 2:00pm]. As the date approaches we will put more information about this fund-raiser here on the website. The Robesonia Community Blood Drive takes place once a quarter, and rotates among the below four Robesonia churches. Our blood drive is done through the Miller-Keystone Blood Center. To help with refreshments on the month that we host, please contact the Mission Committee. For more information or to schedule an appointment to donate, please contact the Mission Committee or the church office at 610-621-5770 or office@sprucc.org. During our regular May youth group meetings we will be planning the 2019-2020 youth group activity calendar. Dates and times have not yet been set for this youth group activity. When details are developed for this activity, we will list them here. The annual Conrad Weiser Baccalaureate Worship Service will be held on Thursday, June 6 in the Conrad Weiser High School auditorium. The annual baccalaureate is organized and led by the Conrad Weiser Ministerium and the Conrad Weiser graduating class. Dates and times are still tentative for this youth group activity. This annual event gets better and better each year. Our annual car show features a variety of cars. Four classes and one best in show will be judged and awards issued at the end of the show. The show will be held in the grass lot behind St. Paul’s UCC. There will be catered foods, soft drinks, and door prizes available. August 3, 2019 is $8.00; and registration the day of the show is $10.00. You can view pictures from previous years on our website under the “Photos” tab at www.sprucc.org. Dates and times have not yet been set for our 2019 VBS program. This is a combined program with St. Daniel's ELCA. This year St. Paul's UCC will be hosting the VBS program. (St. Paul's UCC hosts on odd years and St. Daniel's ELCA hosts on even years). For more information, please contact Elsa Wertz, Denise Unger, or any member of the Christian Education Committee. For a registration form, please contact the church office atoffice@sprucc.org or 610-621-5770. Look for more information and registration forms in the May 2019 issue of The Herald. We will be gathering for worship at Knoebels Amusement Park in Elysburg, PA at Pavilion Tent #4 on the third Sunday of August at 10:30am. Friends, family, visitors are all very welcome to participate. There is NO park admission fee. There is NO parking fee. You need only to pay for ride tickets (for whatever rides you may wish) and any food you may wish to purchase there. For those who are unable to journey with us to Knoebels, we are planning to have a worship service in our sanctuary at 9:25am. Tentatively, St. Paul's UCC plans to host a community Thanksgiving Eve Worship Service on Wednesday, November 27, 2019. Check here for updates, as Thanksgiving approaches. For more information about our Thanksgiving Worship Services please contact Terry Pastor, chair of the Worship Committee.